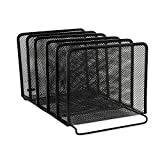 Rolodex Mesh Collection Stacking Sorter, 5-Section, Black (22141). This tray sorter has 5 sections to help keep your desktop organized and clutter-free. Mesh collection desk accessories have a simple and elegant industrial look and sturdy metal construction. Desktop organizer’s vertical vanes hold notepads, books, binders, folder, and other items. Stacks on top of Stacking Side-Load Letter Tray (62563). 8.25 inches long by 14.375 inches wide by 7.75 inches high.